Eras cannot be neatly sliced up according to decades or even generations. Graphic design keeps changing while somehow staying the same. I used to go to an Albanian barber named Marika. Razorcuts were in fashion at the time, and once, as she aimed her scissors at my ear, I asked Marika why she didn’t use a razor. ‘How can I use a tool that only cuts one way?’ she replied scornfully. Marika was not too old world to accept alternative technologies. Rather, she was too old guard to trust an instrument that, by imposing its own constraint, curtailed the designer’s ability to accept the constraints of the problem, in this case the multi-directionality of hair growth. A characteristic of any old guard is an acceptance of constraints and discomfort in their absence, reflected in Robert Frost’s assertion that he never wrote free verse because he couldn’t tell what he was working against. Frost was both right and wrong, I think. Right about what makes free verse difficult; wrong in implying that it is therefore less valid. The old guard always believes that members of the new one aren’t working against anything, but they are. They just aren’t working against the same constraints. Frost did write one poem in free verse, and it splendidly illuminates where the old guard comes from and where the new one goes. This is the poem. For fear it would make me conservative when old. What begins as the process of changing the guard can deteriorate into a process of guarding the change. But the image is misleading, enlisting metaphor to obscure meaning rather than to vivify it. ‘Changing of the guard’ denotes an orderly ritual in which tired bodies yield to fresh ones, and in certain routinised areas of life this happens. As a marine, I was assigned for a few weeks to a guard duty routine known as four on / eight off. Armed with carbines we would never master or need, we stood on the decks of Liberty ships while supplies were unloaded from their holds. After four hours we were relieved, and eight hours later we relieved the guards on some other Liberty ship. The name of each ship was painted on its prow, but the vessels were otherwise identical. And so were we. Our names were stencilled on the backs of our jackets, but we must otherwise have been as indistinguishable to the crew as the ship was to us. The guards who replaced us might just as well have been us, a phenomenon novelist Nicholson Baker calls the ‘renewing of newness’. In Mezzanine, surely the only novel based on a plot consisting entirely of design details, Baker describes the sensation of pulling a paper towel from a dispenser that instantly replaces it with a different towel that is, however, not different at all, eliciting a joy he finds repeatable in watching ‘one sticky disk of sliced banana displaced from its spot on the knife over the cereal bowl by its successor’. That kind of newness renewal applies to banana slices, paper towels, escalator steps (another in Baker’s series) and waves. But it does not help us to account for the New Wave. The change that matters does not appear predictably, evenly or punctually. It is rarely formal and never tidy. Eras run into each other (the 1960s in America, for example, lasted well into the late 1970s). Change comes in messy fits and starts, including false starts, which are often nothing more than fads marketed as trends. The lines between old guard and new are as blurred as if the animator R. O. Blechman had drawn them. The 1960s, for example, is credited with separating the hip from the square. If so, it was a feat accomplished by some curious crossovers. The old guard of the 1960s was notoriously defined as over 30, but it was defined that way in communications media that were themselves defined by Marshall McLuhan, then in his 50s. The most effective smart-assed alternative magazine of the period, Ramparts, was art directed by Dugald Stermer, a raging classicist. During that period the Yippie Jerry Rubin wrote a book called Do It! which was appealing not for anything it said, if it said anything, but for a format – short takes animated by startlingly diverse graphic juxtapositions – that seemed to betoken a new way of saying. 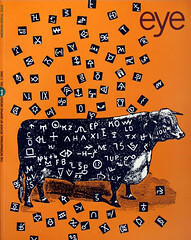 The intellectual vitality that was the book’s real content was lodged in the layouts by Quentin Fiore, an old-school designer. Ramparts had to be read to be believed, and Stermer made it readable. Do It! was a demonstration (to borrow the title of an earlier book Fiore designed) that the medium was in this case the massage. Ralph Caplan: Benson, your work has been called distinctive. How is it distinctive? Benson Crane: Well, for one thing, I’m not just trying to paint signs or make marks. I offer a Total Communications Program. A published interview with a graphic designer must include samples of work. Crane’s oeuvre was assembled from a number of first-rate designs by Peter Bradford and Phil Gips that had been rejected by clients. We published them, with captions that were wholly consistent with the exaggerated inanity of the interview. The reaction? A few readers objected that Crane was getting a lot of publicity for someone who had nothing new to say. A few others applauded the magazine for at last publishing a designer willing to challenge the status quo. Having failed as parody, Crane was eventually viewed as hoax. But in the meantime, inquiring minds were divided as to whether he was establishment or young turk. It was a long interview (even fictitious designers talk a lot), and ended with the kind of thing designers were saying then. Am I wrong in thinking it is not much different from the kind of thing designers are saying now? RC: What do you think about the future of graphic design? BC: I don’t think about it very often. I just don’t see it changing much, no matter how fancy the electronic gadgetry gets. Designing for a computer is the same in all important respects as designing for the printed page. True, designers know almost nothing about … electronic data processing, but for that matter they usually know nothing about ink and printing presses either. RC: What about your own future? BC: I think about that a lot … As a designer, I would like to set things in motion for myself. I am coming more and more to feel that there is no point in being involved in the action if you don’t own a piece of it, and the only way for a designer to own a piece of it is to start it himself … I’m tired of dressing up other people’s companies. Now I want to find my image. RC: What will you do when you find it? BC: Change it. What else are designers for?